FITZPATRICK BROTHERS was one of the first collision repair centers in the area to adapt a computerized laser measuring system. Along with the use of the Chief EZ Liner Frame Machine, this system gives us the ability to bring your automobile back to factory specifications after just about any accident. 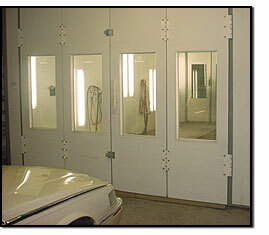 Every car is painted in our Blowtherm downdraft spraybooth. The air is filtered and heated to ensure the best quality finish. The booth has a 1.5 million btu burner that cures every finish. We use PPG finishes, which come with a lifetime paint guarantee, giving you peace of mind. We mix all of our PPG paints on the premises. Paint codes and formulas are kept on computer disc and are updated regularly, ensuring proper paint match for your vehicle. 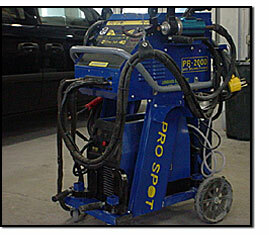 We use the Pro Spot PR2000 welder for all of our weld-on panel replacement. Pro Spot is approved by BMW, Toyota, Lexus, Daimler Chrysler, Nissan, Volvo, Volkswagon, Audi, Saab, Infiniti, Isuzu, and many others manufacturers. The welder's inverter system is the latest and most advanced technology available for resistance spot welding. This means that you are getting factory approved welds on your car, ensuring the highest quality repair.